Eid is ahead, and Maria B is completely in action to give her Mbroidered for the year of 2018. So, get ready to delve into the luxury fabrics amazingly adorned with Swarovski elements and Maria B Embroidered collection both because your favorite designer has officially become the partner of Swarovski integrated branding. 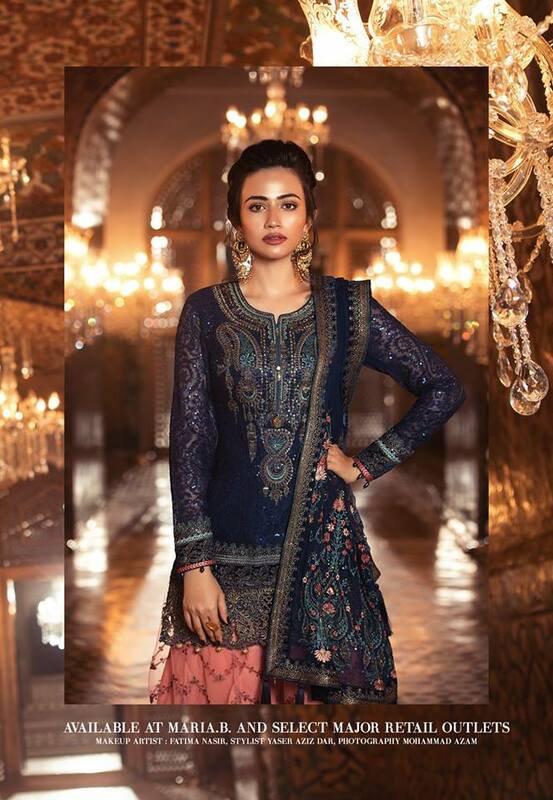 Recently, the brand launched its Lawn collection, and now it was like Eid package when it gave us it was another wonder of Mbroidered Eid Collection. Moreover, this dreamy assortment has been launched a few days back. 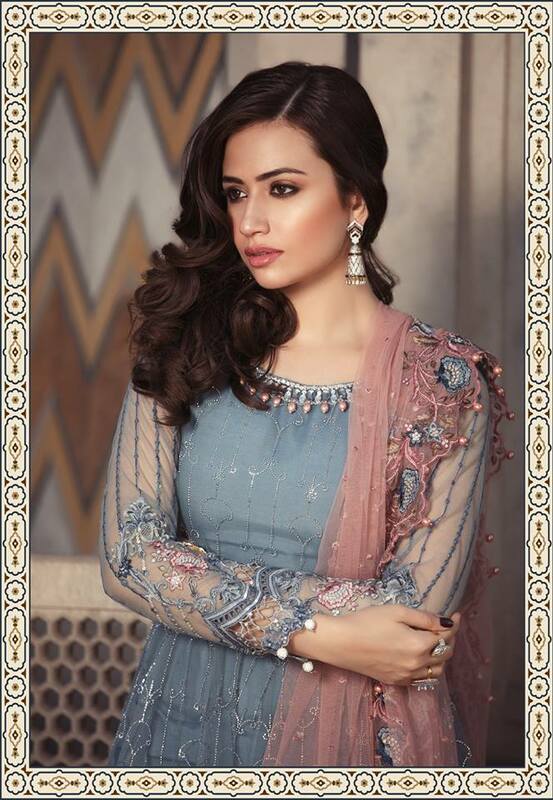 The model is your most favorite “Sana Javed”. The series comprising of Mindblowing dresses which are perfect for festivals and coming wedding season. The embroideries on dresses are so delicate and chic that one can’t get over his eyes. Here we are posting the complete updates and collection from the top designer of Pakistan that is Maria B. I hope you will people will find it the best. Today we will share Best Eid Women Dresses Maria B Mbroidered Eid Collection 2018-2019. 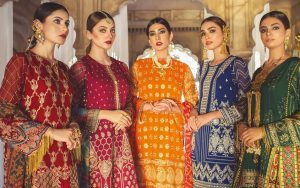 The recently launched Best Eid Women Dresses Maria B Collection is an inspiration of patterns and motifs of centuries-old civilizations that provide a timeless element to designs. The high-quality fabrics, beautiful prints, and elegant thread embroideries are the components of these dresses available in the variety of dark and light colors of grey, brown, white, pink, peach, etc. While the Embroidered Eid Dress series is huge and most awaited one as every girl is trying hard to find dresses embedded in beads, diaconates, stone works and embroidery decorations. It consists of eight luxurious designs. Each one is full of elegance and style. Maria B’s Mbroidered collection is compatible with creativity, setting new symbols of luxury and opulence on a global scale. In keeping with this royal tradition, it brings you the coveted MBROIDERED Unstitched chiffon Eid Collection ‘18 embellished with crystal droplets and Swarovski buttons. 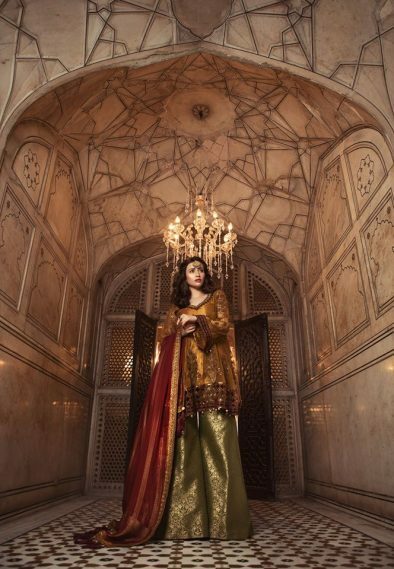 From deeply traditional ghararas and embroideries. 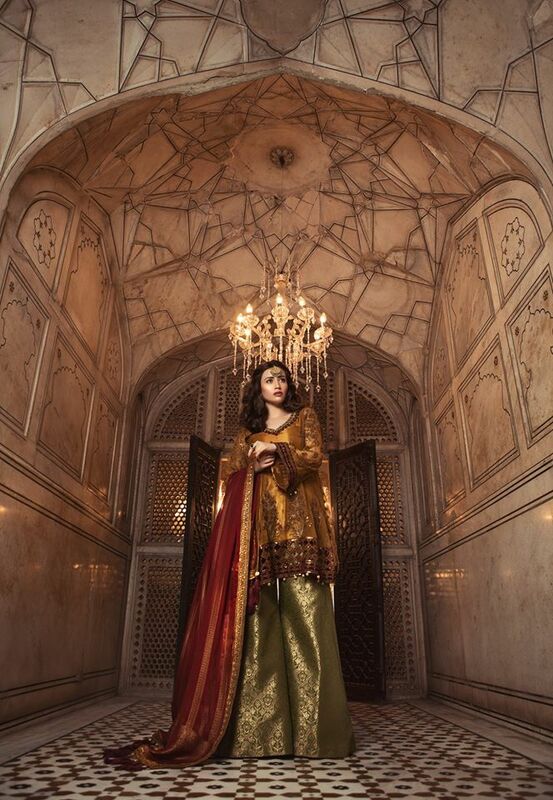 Celebrating our rich culture with an exotic color palette to contemporary vintage sparkled designs. Maria B Mbroidered dress series is launched now, rush to your nearest store before the collection gets out of stock. The beautiful suits contain sleek embroideries at necklines, borders, and handcuffs. Pastel colors like peach, beige, sea green, off-white, light pink, sky blue, etc. this time Maria B has presented a saree style and lehenga choli with a perfect blend of adornments and colours. Saree is a just superb, selling like hot cakes and becoming a “dream to get” of every Pakistani women nowadays. You can also make lehenga choli, ghararas, shararas as per your choice. Hope you haved loved this amazing assortment. Keep following us for more. This black number is for those you are black lovers like me. The shirt has all over embroidery and beautifully embellished sleeves with petals. Paired with grip undershirt and cotton satin pants. This metallic rust and maroon is such an exceptional combination. Really loved this design. It comes up with embroidered zari work velvet patches for ghera and sleeves. The neckline is embellished with maroon fancy pearls. It has Chiffon Jacquard plain dupatta with 4 sided velvet border. The powder peach dress has Diamante embroidered chiffon front with pearls. 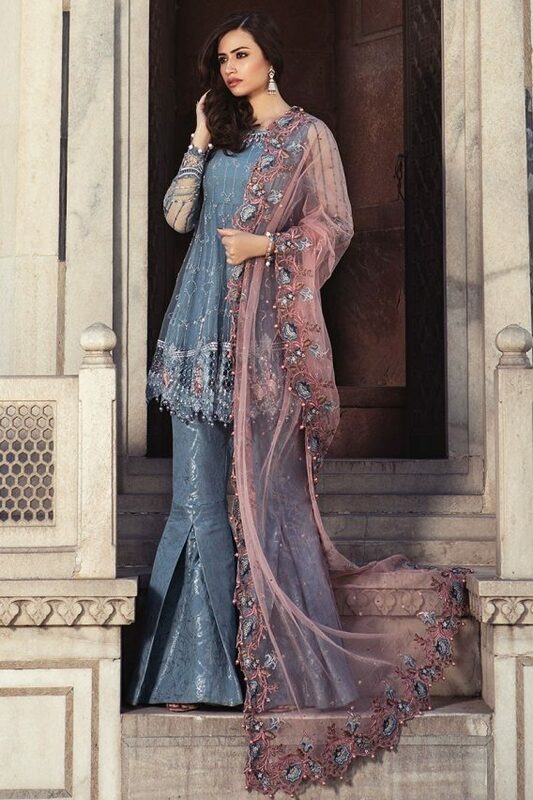 Net dupatta and net patches with 3-d flowers. This is such a decent design worn on festivals and occasions. The royal maroon and green combination is full of grace and charm. The chiffon shirt has embroidered neckline and patches. It has net dupatta with side borders. Also comes with grip undershirt, Jacquard trouser and stone hanging balls. Sapphire Blue and Coral dress is full of rich color and style. 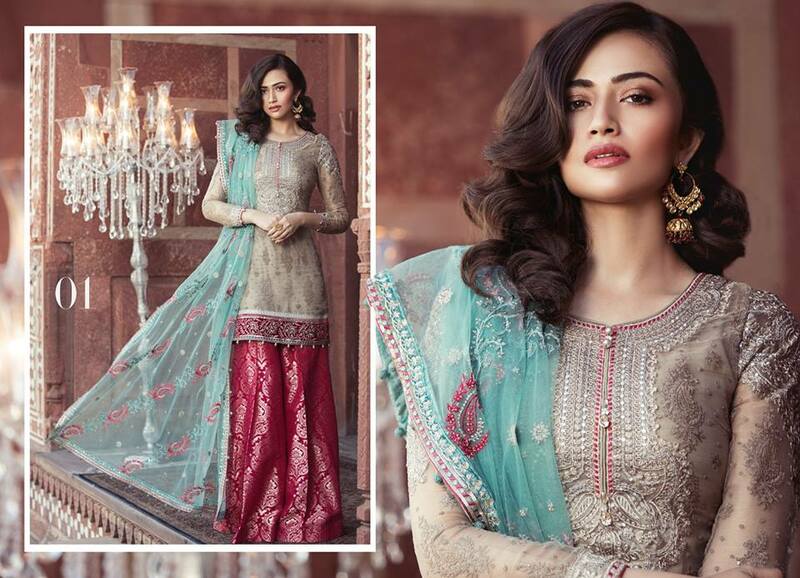 It has diamante embroidered chiffon dupatta with Embroidered velvet 4 sided lace. Paired with a fancy coral pink gharara. Accessories include velvet and organza patches with Swarovski buttons. The full embroidered Moonlight shirt looks so good with Sea Green net dupatta having a fancy border. Paired with a fresh pink color Jacquard pants. It is best to wear at festivals, weddings, and parties. For those who love light colors in this hot weather. Here comes the design, the pearl white chiffon suit. It is beautifully embroidered and comes up with Swarovski buttons. Cerulean Blue has Diamante embellished net front, embroidered back and sleeves. It has beautifully adorned neckline with fancy embroideries and accessories. 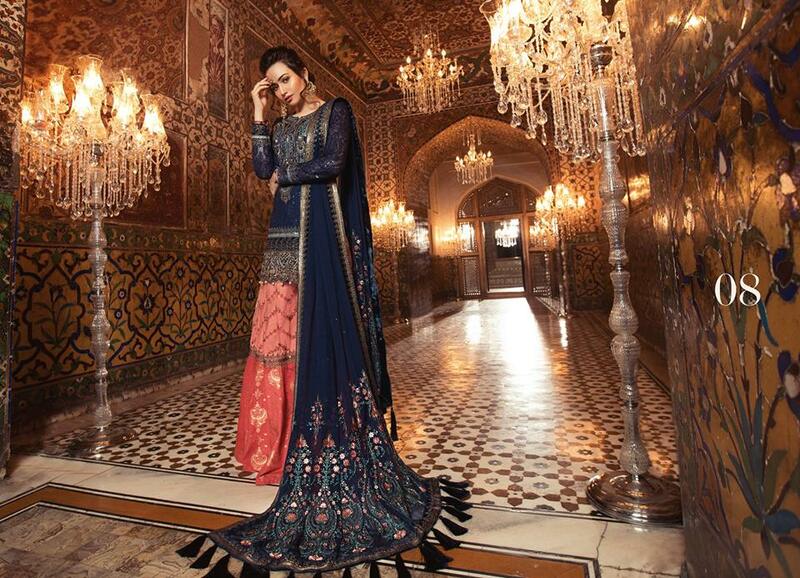 The embroideries, cuts, embellishments are just beyond the words. Plus the color contrast lead us to highly creative. Each piece from this collection is fully prepared to elegance. Jamavars, net, Jacquard, Chiffon, Silk, etc are the fabrics. You will fell in love with each and every designs. The handmade necklines giving a fancy touch to the simplicity. Have a look at the images below and get to know about the latest designs. Have a look at the below posted Best Eid Women Dresses Maria B Mbroidered Eid Collection.